In recent years, the City Council has placed a high level of importance on code enforcement activities. In addition to monitoring construction, Code Enforcement Staff works to achieve code compliance as it relates to property maintenance. 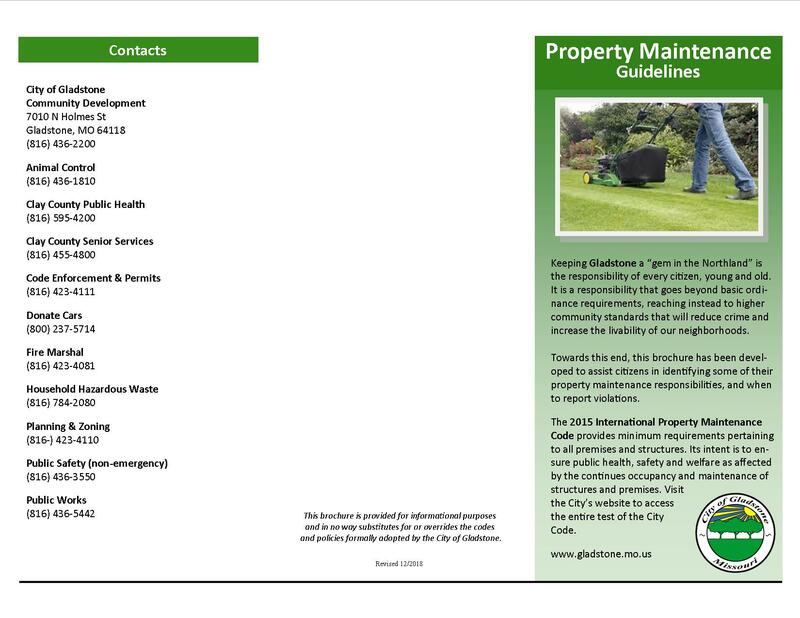 By meeting the City's established property maintenance codes, the owners help keep property values in Gladstone high. Residents and business owners should never underestimate the negative effect simple blight can have on neighborhoods and the City overall. When an area begins to deteriorate, a ripple affect begins to spread outward. Statistics show crime increases as neighborhood blight increases. When owners show pride in their properties by keeping them well maintained, neighborhood strength grows. As a result, the overall quality of life in the City is improved. Feel free to call our office at 816-423-4111 or click here if you have further questions. * Note: Search limited to the last one year. Copyright © City of Gladstone. All rights reserved.